Use Lite & Tough gloves and limit their exposure to toxic chemicals known to the State of California to cause cancer and birth defects. Prop 65 Approved!FDA Approved 510K! LITE & TOUGH NITRILE POWDER FREE 9.5"
Only for California but soon the whole country will demand safer disposable gloves. Infi-Touch Gloves sold through BNG has nitrile gloves that are Prop 65 approved and FDA approved now! Used for medical, industrial gloves, food handling work gloves, janitorial, manufacturing, automotive, plumbing and more. BNG is committed to food safety, not only with gloves but with plastic V-Boards. They are protecting their customers who in turn protect their customers and employees. Employees working in a wide range of industries that need sterile gloves with no allergies and maximum hygiene, from food service cut resistant gloves to factory work nitrile disposable gloves to medicine and everything in between, rely on nitrile surgical gloves to keep themselves and those they serve safe. These gloves often provide the last line of defense between you and your clients and the harmful germs that can create serious acute and long-term health issues. While they are an essential element of infection control, and an inexpensive way to keep your employees and your customers safe, it’s common to overlook the glove inventory until it you come to the realization that it’s running critically. It’s important to realize, however, that not all black nitrile or vinyl gloves are created equal nor are puncture resistant, or have chemical resistance to increase hand protection. Whether you’re chopping vegetables or handling delicate medical waste, the last thing you want is to risk dangerous skin exposure and contamination. 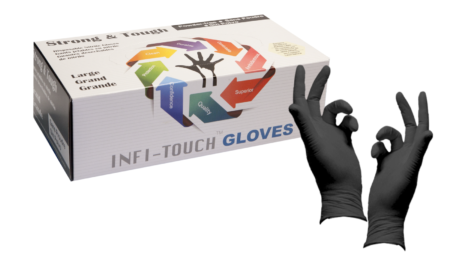 BulkNitrileGloves.com is a proud distributor of Infi-Touch exam gloves, the highest-quality, most durable and reliable nitrile disposable glove on the market. Bulknitrilegloves.com offers the strongest puncture resistance and most affordable nitrile gloves (powdered or non powdered, latex exam gloves or nitrile exam gloves) in bulk for those who need the best disposable nitrile gloves. Give your customers and your employees the safety they deserve with no allergic reaction from low quality rubber gloves. Call bulknitrilegloves.com today at 877-898-2057 to place your order. Aluminum is expensive to buy, repair, keep and is less safe.